In a large skillet, cook bacon until crisp over medium heat. Drain on a paper towel-lined plate, reserving 2 tablespoons of bacon drippings in skillet. 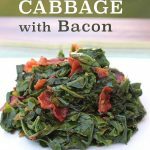 Add Chinese cabbage to skillet and stir to coat in bacon drippings. Add water. Stir cabbage constantly until it wilts, about 5 minutes. Cover skillet and cook an additional minute or two. Remove from heat. Crumble bacon over Chinese cabbage and season with pepper. Serve immediately. Watching fat? Use turkey bacon and substitute olive oil for the bacon drippings.